The Mennonite Heritage Center holds a large and significant collection of Mennonite fraktur from Eastern Pennsylvania. Throughout the year, works from the collection are on display in the Mary Jane Lederach Hershey Fraktur Gallery. You can also view the fraktur collection in our online catalog. The Heritage Center is located in the heart of an 18th century Mennonite settlement. The Philadelphia (now Montgomery) County townships of Skippack, Lower and Upper Salford and Franconia were settled mainly by immigrants whose roots were in Switzerland where they had suffered hardships and displacement. They arrived first in Skippack in 1708. In 1717 a second group settled on lands that now surround this Mennonite Heritage Center (MHC). Among the early arrivals was Christopher Dock, a schoolmaster who had taught in Germany. Dock brought with him the memory of a decorative form of writing which he wrote about in a book on school management, the first book on the subject published on this continent (Schul-Ordnung , 1770). In his book Dock describes his practice of giving to students who had excelled “a flower drawn on paper or a bird.” And he awarded a special certificate (Zeugnisz) to a child who had learned to read. These gifts that Dock described are now identified as “fraktur”. They include a body of beautiful examples of penmanship and decorative motifs, called fraktur because of the broken or fractured style of the German lettering used. The MHC houses a collection of fraktur from eastern Pennsylvania Mennonite meetinghouse schools that spans the entire spectrum of fraktur specimens. The largest pieces are known as Vorschriften (writing models). A Vorschrift usually contains a hymn or a moral teaching, often has the alphabet in upper and lower case, sometimes include the numbers and occasionally the months of the year. Many of these writing pieces contain colorful birds, tulips, borders and more. The name of the child who received a Vorschrift is sometimes included as is the date that the schoolmaster created the piece. 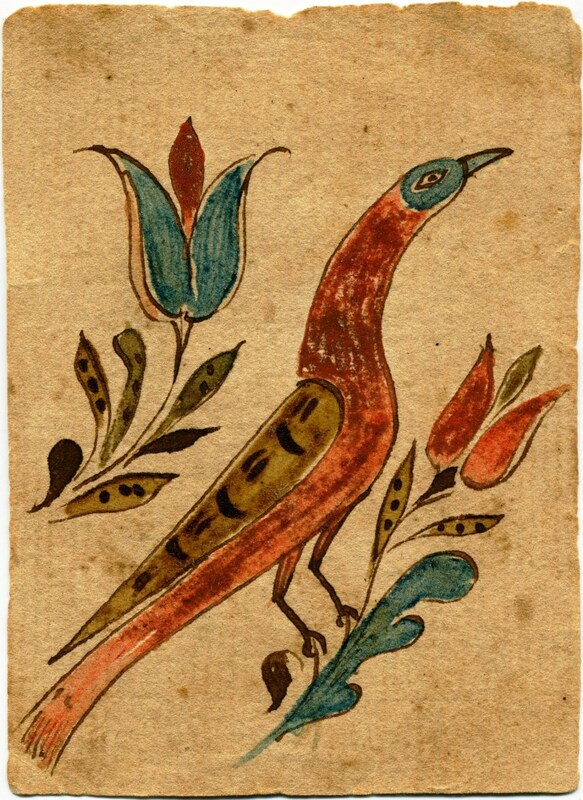 The flowers and birds drawn by Dock and many schoolmasters that followed him are now treasured in the world of fraktur as small, exquisite student rewards. Other forms of fraktur include bookplates in printed hymnals, Bibles and Testaments; bookplates in handmade Notenbüchlein (manuscript tunebooks); birth and baptismal certificates; family registers; and teaching pieces. All of these types of fraktur are included in the extensive fraktur collection at the MHC. Other collections with a similar array of eastern Pennsylvania Mennonite fraktur include the Schwenkfelder Library & Heritage Center, Bucks County Historical Society, the Free Library of Philadelphia, Philadelphia Museum of Art, and Winterthur Museum. Sections of Bucks, Northampton, Lehigh, Berks and Chester counties were also settled by Mennonites in the 18th century. These congregations established meetinghouse schools similar to those started by Dock at Skippack and Salford. Numerous pieces of fraktur from these areas, especially Bucks County, are part of the MHC collection. Lancaster and central Pennsylvania were home to a separate community of Mennonites and Amish who had their own fraktur tradition. Other Pennsylvania German communities (primarily Lutheran and Reformed) produced fraktur that focused on baptismal and family records. The MHC’s largest group of fraktur made by one schoolmaster is from the hand of Andreas Kolb (Andrew Kulp) who taught in Montgomery, Bucks and Northampton (now Lehigh) County schools from 1785-1809. Other significant collections are from the creative pens of Lutheran John Adam Eyer, teaching in Bucks County at Deep Run, Perkasie and Rockhill meetinghouse schools from 1779-1787 and Mennonite David Kulp teaching at Deep Run, Bedminster, Perkasie and Plumstead from 1801-1817. Other schoolmasters who produced fraktur include Huppert and Christian Cassel, Henrich Brachtheiser, Johannes Mayer (John Moyer), Samuel Moyer, Jacob Godshall, Rudolph Landes, Jacob Hummel, Jacob Oberholtzer, Isaac Hunsicker, Samuel Godshall, Henry Johnson, and Jacob Gross. Examples of fraktur by each of these artists who taught in Mennonite schools are represented in the MHC’s remarkable collection. 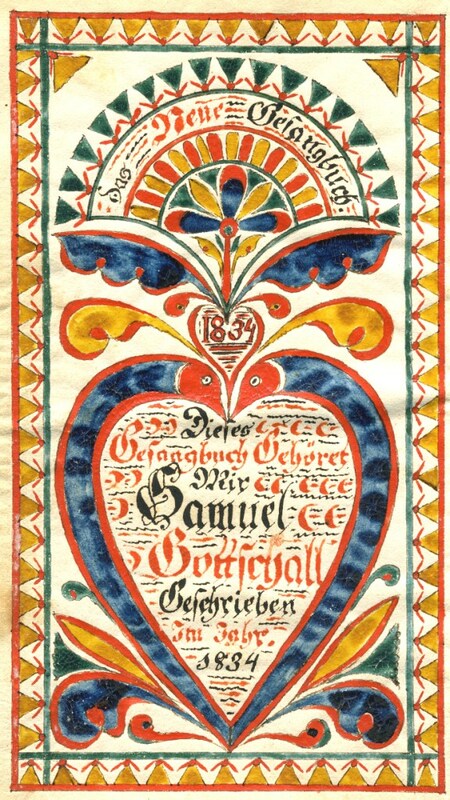 Fraktur writing flourished in this community from approximately 1750 until the 1840s when Pennsylvania German communities accepted new state-sponsored public schools, which were conducted entirely in English. However, the vibrant fraktur treasures of preceding decades were cherished by those who received them, tucked away in family Bibles and heirloom chests, and passed from one generation to the next. Traditional fraktur was revived in the early-to-mid 20th century by local historians and artists, including Mennonite poultry farmer John D. Souder of Telford who copied many old pieces of fraktur found in the farm homes of friends and neighbors. 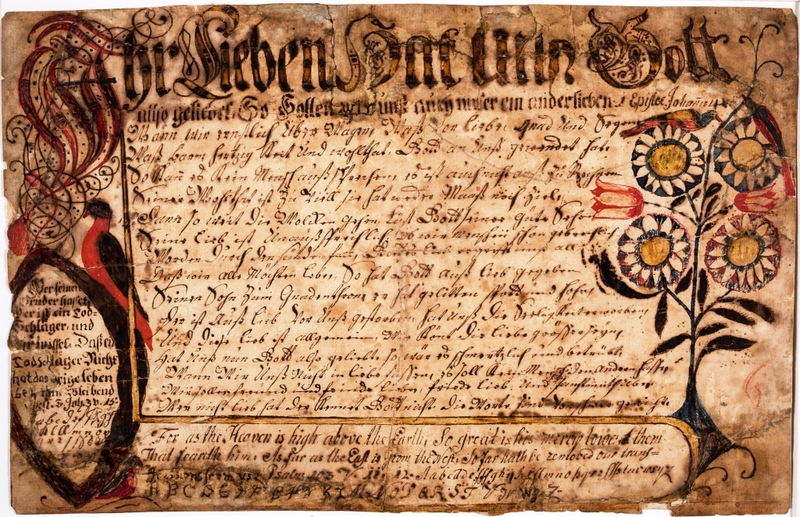 In the late 20th century, fraktur again became popular as a style for commemorative certificates and decorative pieces in the Mennonite communities of Pennsylvania. The MHC collection includes a number of these contemporary art works. Please stop in and see the treasures “old and new” that are on exhibit in the Fraktur Gallery.